We’ve found some fun and inspiring ways to add a little delicious into your routine. Quick and flavorful meals that your family will love, even if they’ve only got a few minutes to enjoy. With the kids back in school, back in sports, and the spontaneity of summer fading in the rear view mirror, life settles into a familiar and often frenetic routine. So much on our plates, yet we still need to get dinner on the table. For those nights when it seems everyone is on a different schedule, Mini Pepperoni and Olive Pizzas make a perfect grab-and-go dinner or a fun way to engage the whole family in building their own. Made with simple ingredients, it’s easy to include them in your regular shopping or a snap to pick up at the last minute. Just start with individual-sized pre-made pizza crusts and your favorite pizza sauce, then layer on the toppings. Limiting the ingredients to just a few will make the delicious flavors really pop and keep those crusts crispy. Sliced pepperoni, DI LUSSO® Provolone and Mozzarella Cheeses and Pitted Kalamata Olives are a tasty trifecta of flavors. Finishing with a few fresh basil leaves adds a fragrant, peppery taste and beautiful color. Each pizza is it’s own little masterpiece. Add a little Asian-inspiration to a weeknight dinner. Brimming with fresh flavor, our Warm Roast Beef Bowls will soon become a family favorite. Simple ingredients mean it’s easy to include them in your regular shopping or a snap to pick up at the last minute. Freshly chopped vegetables give this dish great color and a tender, tasty crunch. Combined with luscious DI LUSSO® London Broil Roast Beef and sesame-ginger stir-fry sauce, it makes the perfect one-bowl meal. Serve it over your choice of white or brown rice and enjoy! Chopsticks optional. Make ahead and chill or toss together in a flash. 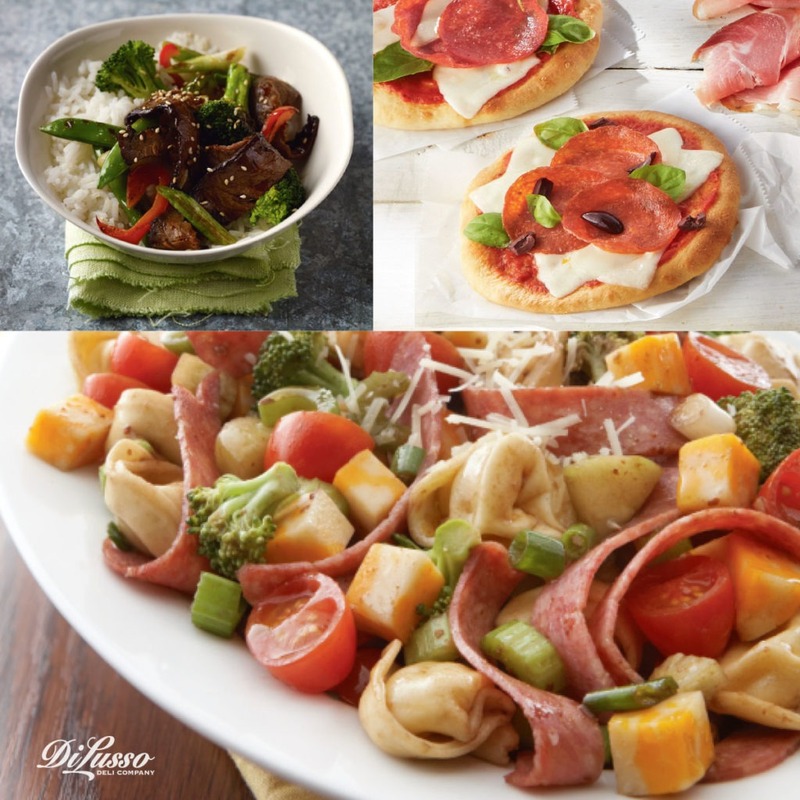 Our Insalata Di Pasta is filled with Italian favorites that meld together to make every bite a burst of flavor. This is also a great dish for doubling. With the cheese filled tortellini, DI LUSSO® Honey Roasted Ham and Colby Jack Cheese, it’s hearty enough as a main dish for dinner. Fresh vegetables like cucumber, broccoli and grape tomatoes make it perfect as a side or lunch the next day. Like you, this salad knows how to multi-task. Classic and delicious, it’s hard to beat Hot Ham and Swiss Cheese Sandwiches for a last minute weeknight dinner. Sometimes the simplest dish can be the tastiest, especially when you choose the best ingredients. 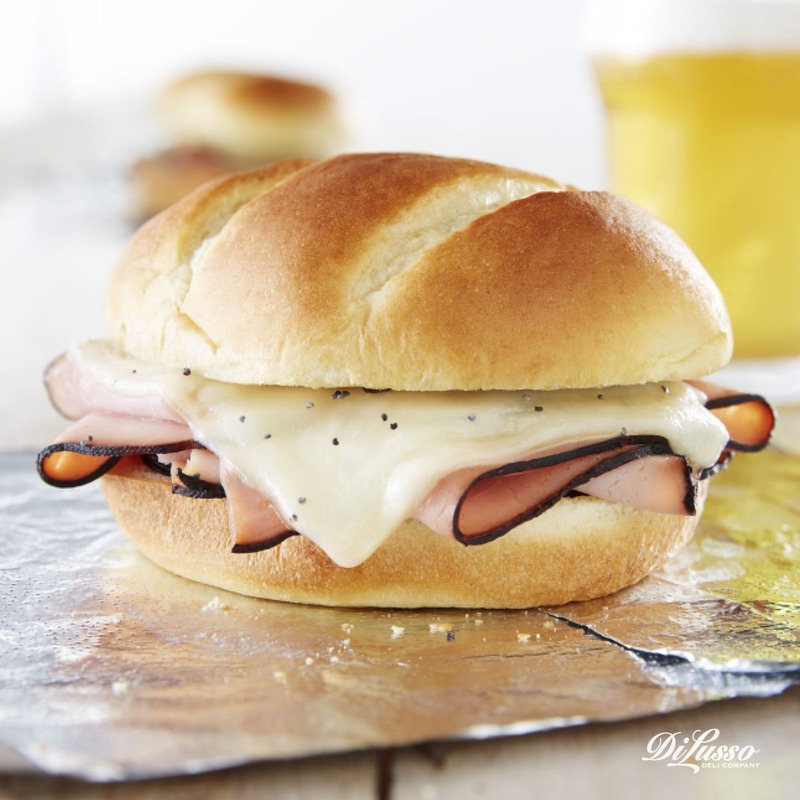 Incredibly moist, rich and smoky DI LUSSO® Black Forest Ham is the star of this show. Every flavorful bite is perfection. Pair it with a mild, nutty cheese like DI LUSSO® Swiss Cheese and stack it on a sliced French brioche bun. It just doesn’t get any better. Except of course with a fabulous spread of softened butter, grated onion and mustard. 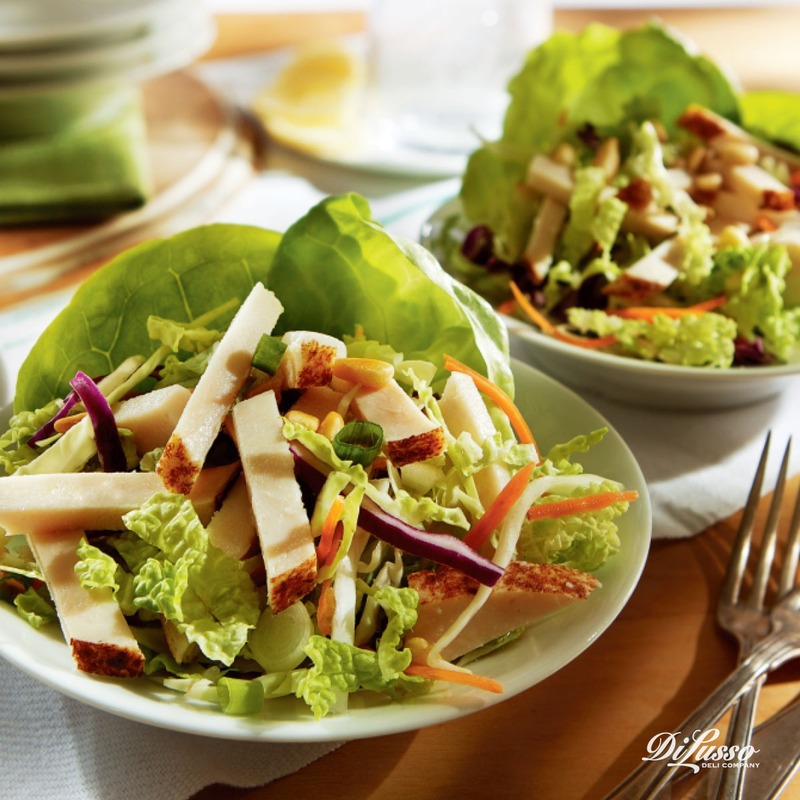 Italian Lettuce Cups are a burst of fresh flavor in the palm of your hand. Or use a fork to get every last tasty piece. Starting with the right lettuce is key. Bibb, Boston and Butter lettuces each yield nicely sized leaves that form perfect little cups. The texture is soft and luscious, yet still provides a nice, subtle crunch. You can chop your own cabbage and carrots or simply pick up a ready-to-go coleslaw mix from the market. Our simple, from-scratch dressing of olive oil, red wine vinegar, DI LUSSO™ Deli Style Mustard and honey brings all the fresh flavors together with just a hint of sweetness. Last but certainly not least, top with DI LUSSO® Oven Roasted Chicken and pine nuts for a delectable, light dinner you’ll definitely want to bookmark.